Nina dos Santos: The so called ‘ringmaster’ in the Libor rigging rates scandal has been handed one of the toughest prison sentences in financial history. Former London trader Tom Hayes has been sentenced to 14 years in prison for illegally manipulating international bank lending rates. He’s the first person to be convicted by a jury since the scandal broke; 11 others are still awaiting their trial. Joining me now in the London studio for more on the broader issue of financial crime is lawyer David Corker. David, first of all, if we look at the length of this sentence, it is extremely long. It is almost double the kind of sentence time that we’ve seen for other people that have been accused of rogue trading on a much wider scale. 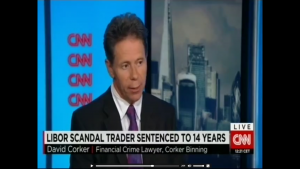 David Corker: Yes, in financial crime this is a top-end sentence. The only similar type of sentence that has been awarded is for people who are convicted on the basis that they are heads of organised crime gangs who have cheated the exchequer out of millions of pounds and stolen vast sums of tax payer money. That is the only kind of preceden; so Kweku Adoboli of UBS, he got seven years, and going back a bit further to Nick Leeson, he got six-and-a-half. So you compare those with 14, and you see how things have moved on. NdS: Why do you think he got 14 years? There is a lot of speculation in the press that its because first he pleaded guilty and said that he was going to cooperate with authorities, try and help them unmask who the other alleged Libor riggers were, and then he changed his plea to not guilty. Could that be one of the reasons behind the sentence? DC: I think that was the most important reason why the judge felt that he was deserving of an exemplary, or even of a deterrent sentence. On his own account, in the witness box, he had manipulated the Serious Fraud Office, he had beguiled them, he had lied to them during 83 hours of interviews, all for his own nefarious purposes. However, that is not the only reason – I also think that this case has become a kind of test case for the banking world, and for the SFO, and for the public at large, to feel that there has been some accountability or recompense for the banking scandals of 2008 and 2009. So Mr Hayes has found himself at the centre of different forces, some of which were under his control, and some of which weren’t. In any event, this now sends out a very powerful message that the scenery for white collar criminals, if they are convicted, is going to be a lot darker for them than it was in relation to those cases I mentioned a moment ago. In other words, in the last several years, the deterrent nature, the punishment levels for white collar criminals, is now escalating. NdS: And that is akin to the situation you see in the United States, where you see people like Bernie Madoff get 150 years in jail. Admittedly, their judicial system works in a completely different way, their sentencing system works in a completely different way, but everywhere around the world what we’re seeing is people trying to draw a line under the 2008 fnancial crash, and punish people retrospectively with these harsh sentences, wouldn’t you say? DC: I wouldn’t say necessarily retrospectively. I think that there is widespread public disquiet that bankers haven’t paid the penalty for taxpayers having to pay out all these sums of money. I think that, as a result of that, there has been a political impulse that we need more resources to fight economic crime, and that prison works – especially for articulate middle-class people, who have choices to make in their lives – and that the clang of the prison gate is a very powerful deterrent to financial misconduct that hasnt been sufficiently recognised in the past, so now is the time to put that right. The Hayes case is the perfect opportunity to do that. 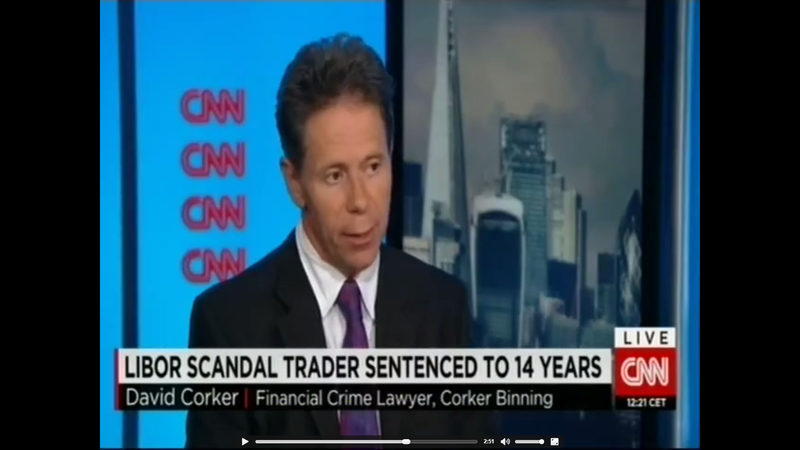 NdS: David Corker, thank you very much for joining us there, financial crime lawyer and expert. Watch the full interview with CNN here.